Tideford's fresh, unpasteurised organic brown miso is made from soya beans, brown rice and koji culture – its pretty remarkable depth of flavour adds a lovely bit of full-bodied umami to stews and sauces. 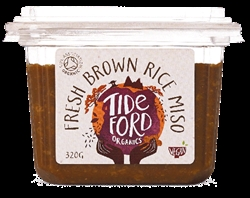 Miso has the quality to subtly combine, strengthen & heighten the flavours and aromas of your cooking from a subtle savoury sweetness through to a rich heartinessdependant on its darkness. *Water, Soya Beans (31%), Brown Rice (23%), *Sea Salt, *Yeast, *Koji Culture. Allergens are highlighted in bold.